So, I finished the hat! It suits her, but she doesn’t like warm clothing of any description so was co-erced into modelling, can you tell? 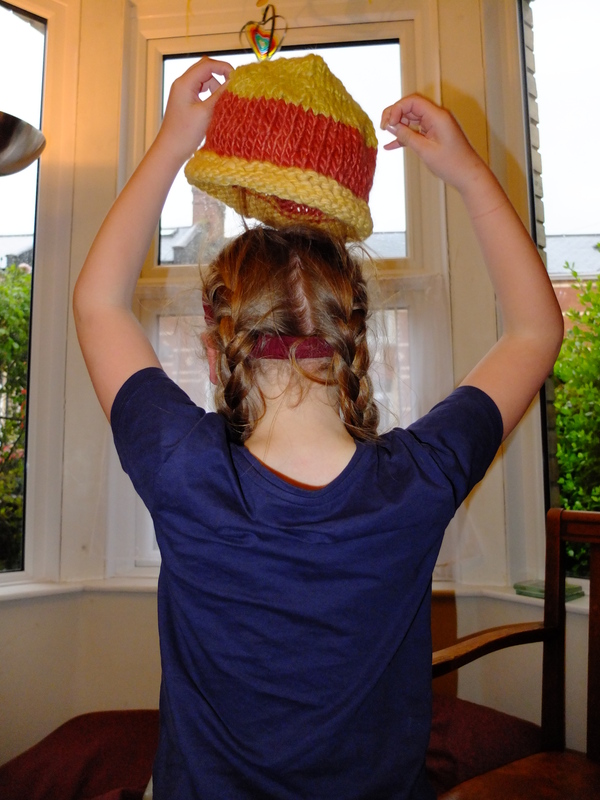 My calculations were a bit off, so it’s come out as a large childs hat (my kids have inherited my large head). It’ll go on one side for now until I work out who to gift a hand wash only kids hat to. Or maybe it’d fit a small headed adult. Hmm. I’m still in love with the yarn colours. 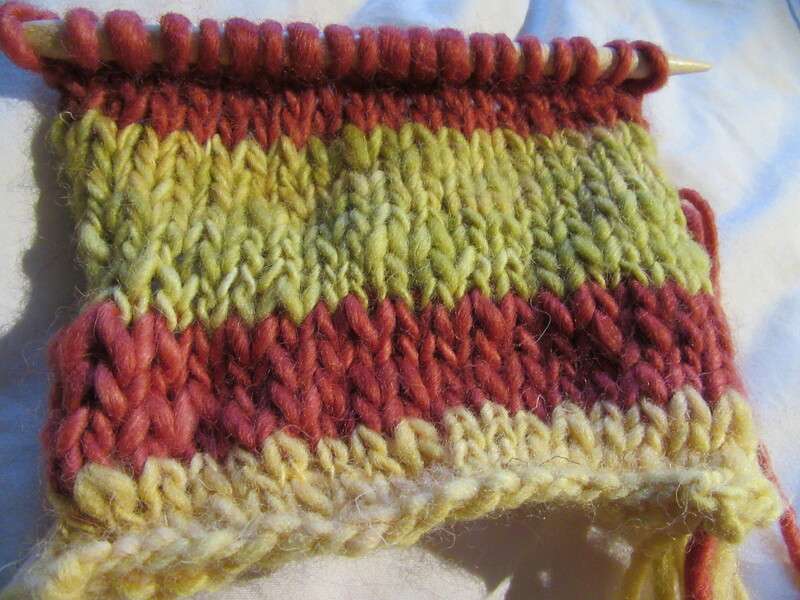 The red feels quite different than the yellow or the green, which I had to knit double to make them work with the red. 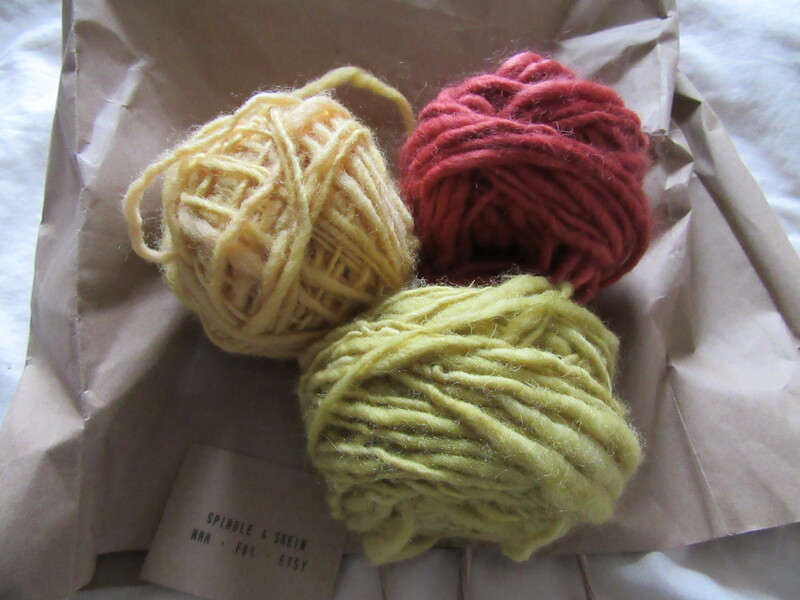 I was warned that I had picked three different types of yarn which would handle differently (I can only remember that one was Blue Faced Leicester, but I can’t remember which one). [edit: apparently the green is Blue Faced Leicester, the red is Masham and the yellow is White Faced Woodland] I knit it on 8mm dpns as they were what I could find. 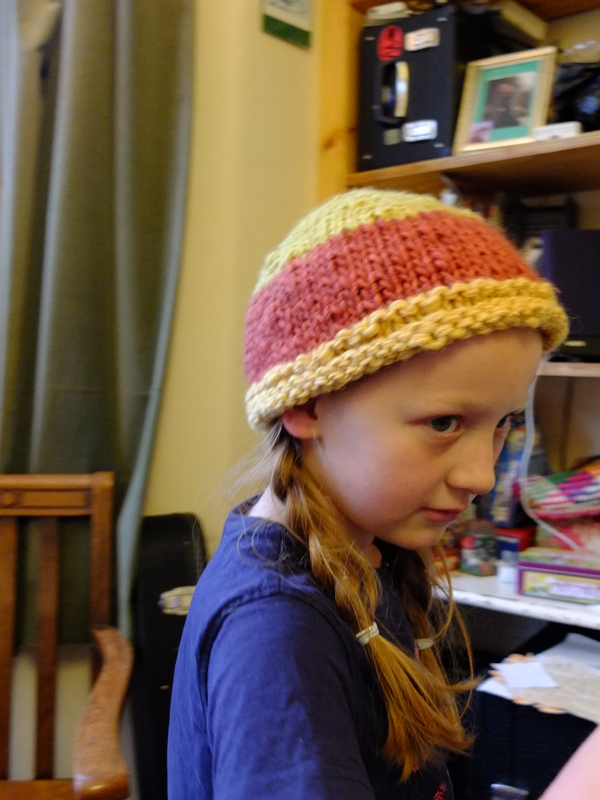 I tend to knit my hats in chunky yarn with a fairly tight tension that makes a firmish hat. I have started a second hat with the leftovers but I’ve had to search for other yarn remnants to make enough for a hat. Which I think will probably also be child sized. I’m not too bothered, my hats all seem to find homes in the end! I also need some more concentrated knitting time to finish the heel flap and turn the heel on my second sock. Hopefully before Wednesday as I’ve found out about a knitting group in a local pub, so I can then mindlessly knit rounds of sock foot whilst chatting. But I’m also looking forward to doing some sewing. For a start (probably, unless I get distracted) I’m finally recutting my Jalie pattern pieces full sized (rather than how they came – half sized to be cut on the fold) so I can cut the dratted skittery stripey fabric I want to use. Which means I might finally be on theme for the Stashbusting Sewalong as May in knit fabric month. Apologies to anyone looking forward to a Moomin related post, I’m just a bit random with my titles sometimes. Repeat after me “I am not doing sewing this weekend, I have guests staying. I am not doing sewing this weekend, I have guests staying. I am not doing sewing this weekend, I have guests staying. Look at me not trace out a pattern. Or cut fabric. Or just get the machine out to do some mending. I am doing so well. Honestly, I did not realise there would be someone spinning at the street market we went to. A little peak won’t hurt will it? And I have to hang around to stop my kids breaking things whilst my son asks his usual barrage of questions, that’s my job as a parent, right? And it won’t hurt to just fondle some of the pretty colours while I’m here. Whoops, I accidentally bought some. But it would be rude not too, we were there a while and she was so patient with the boy. Anyway, I will not be rude and start knitting in front of guests. I will not be rude and … hey, one of my guests is knitting. Right, that’s it…. Test piece done. I may be knitting another hat. Not sure who for yet, other than for someone who knows how to hand wash.
Return of the SWCP… on The walking continues.